In my last blog I noted how public opinion appeared to be changing around the issue of refugees following the tragic death of Aylan Kurdi. Even The Sun was willing to suggest that David Cameron should allow Britain to take in larger numbers. Whilst sympathy towards refugees has grown, there has also been something of a backlash. The narrative appears to often now be “I understand that there are a lot of people fleeing war, but I don’t understand why they’re coming here”. The assumption is that large numbers of refugees have travelled right across the continent especially to try and gain access to living in Britain. The belief being that as there are safe countries in between, if they are coming here it must be for economic reasons. Or, to be crass, for benefits. I’ve noticed this a lot on social media, with friends sharing various images suggesting just this. I’ve seen pictures of Grannies asking “why are we not taking care of old people when we are giving asylum seekers £25,000 in benefits each year”, and pictures of Europe with an arrow from the middle East to here, passing over a host of countries with the phrase “no war” written over them, and then the UK, Sweden and Germany highlighted with the phrase “benefits” written over them. As for the first one, that figure of £25k is based on no facts whatsoever. Seriously, I have tried to see what it could be, and I cannot find anything. The reality is that asylum seekers get very little in benefits, and can be given as little as £5 a day to survive on. A number of these images are created by groups such as “Britain First”, and shared on Facebook. Britain First is essentially a Nazi organisation, grown out of membership of the EDL and similar militant racist organisations. Their aim is simply to whip up race hatred, and they are willing to pull on any strings to get it, whether that be sympathy for our elderly, members of the armed forces, etc. Putting the propaganda of racist organisations through social media to one side, we still have to deal with the questions it throws up. This is the idea that a large number of refugees are coming to Britain. 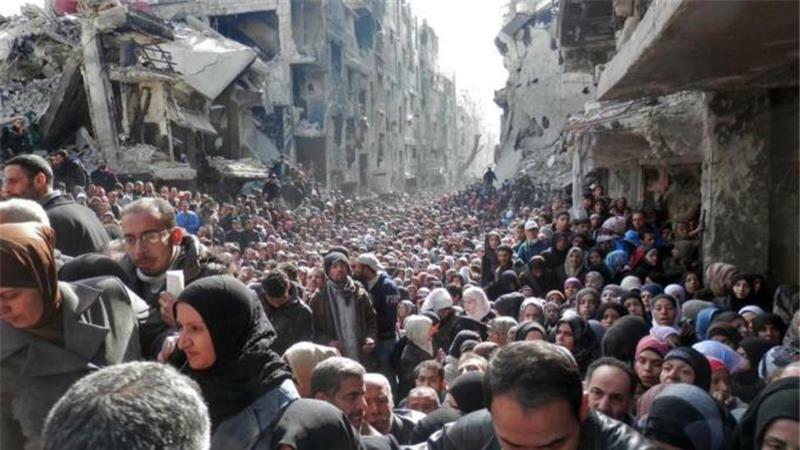 The war in Syria has led to 4 million people fleeing the country. The vast majority, as is usually the case, are currently in the countries immediately neighbouring Syria, such as Jordan, Lebanon and Turkey. Out of 4 million refugees from Syria only 4000 made it to the UK in the last year. Of these, only 187 were allowed to settle in the country. in 2010, there was research carried out by Swansea University in which they interviewed asylum seekers living in the UK to find out why they came to the country. What they found was that people who chose to come here did so because they saw the UK as being a fair, democratic country in which you could live free from persecution, and also that it would be a country that would be sympathetic to them. The vast majority interviewed also showed that they had very little knowledge of the system of welfare in the UK, and came here intending to work. The main factors in coming to the UK was not the ‘pull’ factors of benefits, or even jobs and a higher standard of living, but rather ‘push’ factors – where living became untenable where they were and they had to leave. These are the so called people smugglers. Refugees will be willing to pay these people to help them to escape because it is not something they can do by themselves. It also shows that they are not necessarily destitute, they can afford to pay. It is isn’t simply poverty that makes them want to leave. People leave Syria not because they’ve heard you can get housing benefit in the UK and a free council house, they leave because there are bombs being dropped on their heads, and abuses of their human rights from various forces involved in the war, including the Assad regime and ISIS. They come here because life is no longer possible in Syria, or even in the neighbouring countries they first arrive in. They are willing to put their life at risk because that is the desperate choice they have to make. If we want to stop the people smugglers putting lives at risk, we need to make a route available in which escape is possible. Not just in the UK, but around Europe and the rest of the world. There are many pensioners struggling to survive in Britain today, and that is a disgrace. However, they are not struggling to survive because refugees from Syria are taking all the benefits. They are struggling to survive because we live under a political system that does not care for them. It does not care for pensioners in the same way that it does not care for people with disabilities, it does not care about young people, and it does not care about refugees. We don’t have to chose amongst who of the most desperate we help, we simply have to chose whether we care for all them or not. The bankers put is in this desperate situation, and they’ve got off scot free, living off their riches which was stolen from us all in the first place. Blame the bankers, tax the rich, and make sure that everyone, including our most vulnerable in society, are taken care of.